This playground, in Prospect Park in Acton, features a Spinmee roundabout, zipline, large play structure with a variety of unique climbers and slides, rubber surfacing area, a variety of different swings including an inclusive swing and group saucer swing and benches. All this equipment is from PlayPower Canada. 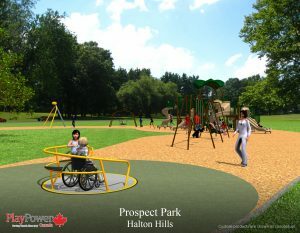 Halton Hills issues a news release where Mayor Rick Bonnette said “There was significant public input into the design and we would like to give a special thanks to Annetrista for her contribution to the Spinmee Round-A bout. This playground is a great addition to Prospect Park which will be enjoyed by families for years to come.” Annetrista Absalom, a local resident, published a children’s book entitled “We Are More Alike Than We Are Different.” The book promotes the independent spirit of special needs children while at play. Town staff worked with Annetrista to find playground equipment that is specifically designed for those in a wheelchair. It is the first of its kind to be installed in Canada and is a part of the new playground in Prospect Park. Proceeds from Annetrista’s book sales went towards the project. 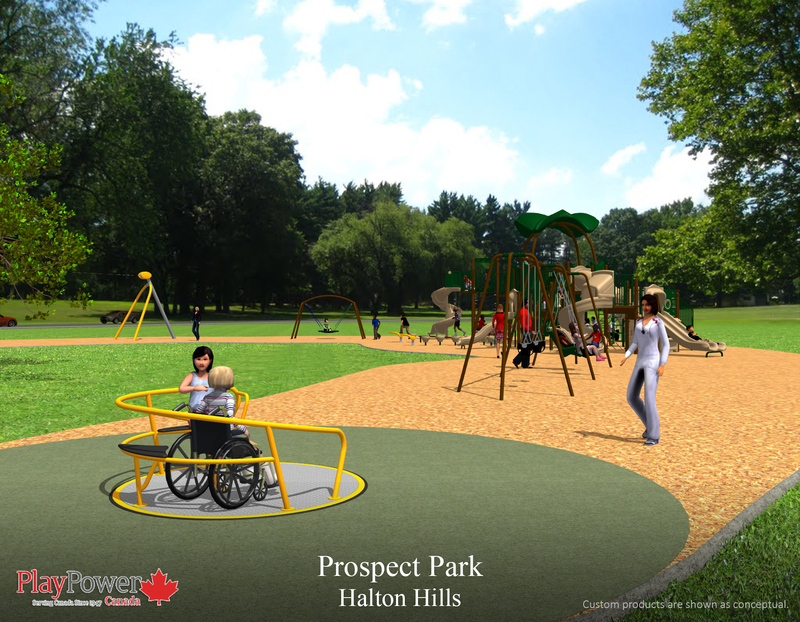 For more information on the Spinmee or and of the equipment in Prospect Park, please contact your local PlayPower Canada representative. Spinmee in Prospect Park. Concept Rendering.